After conquering the commuter segment, it seems Hero MotoCorp has set its sight on the automatic scooter segment. At the 2014 Auto Expo Hero showcased three new scooters. The scooter that grabbed the most number of eyeballs was definitely the ZIR- a 150cc scooter. The ZIR was unveiled in two different variants, the flat board model and the stunning European style step thru. The ZIR has been loaded with features, which were never seen in the scooter segment, like dual projector headlamps with day light running lights integrated in them, petal disc brakes, LED turn indicators and tail lamp, windscreen etc. Apart from visual differences, the European style step thru variant gets additional features like cowl-mounted console, and a larger windscreen. Both the models will be powered by a 157cc, liquid-cooled mill producing 14PS of power and 12.7Nm of torque. Hero claims that the ZIR can hit a top speed of 110km/h. 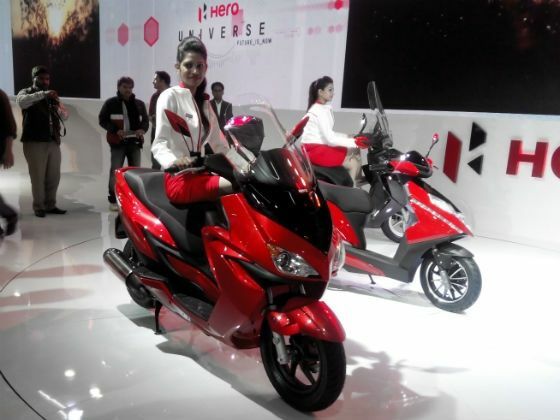 Hero announced that the ZIR will be launched only in 2015 and haven’t revealed any details about its pricing. With the ZIR, Hero plans to revive a new segment of maxi-scooters, which was started by the Kinetic Blaze close to a decade back. But the Blaze wasn’t accepted warmly by the consumers but whether Hero would succeed or fail only time will tell but with the ZIRE it has made a strong statement. Also unveiled at the event was the new Dare scooter. 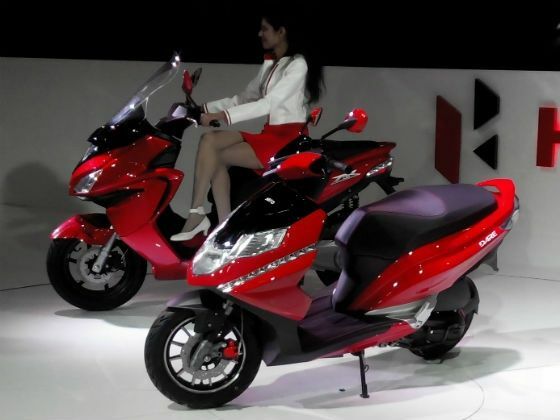 The Dare is a 125cc scooter, which according to Hero has been designed to appeal to the male buyers with its snazzy and sporty styling. The Dare is powered by a 125cc, air-cooled mill pumping out 9PS of power and 9.5Nm of torque. The new offering has been loaded with features like telescopic forks, disc brake at front, alloy wheels, LED day light running lamps and tail light, full digital instrument console, mobile phone charging socket, boot light etc. The Dare will be launched by mid-2014 and no details about its pricing were given at the unveiling event.